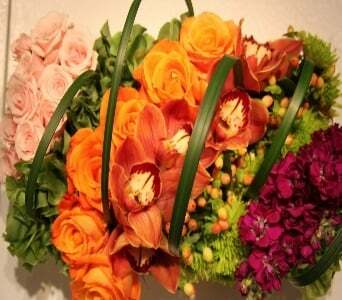 On Election Day, stop into Exotic Flowers at 609 American Legion Hwy, Roslindale, MA 02131. 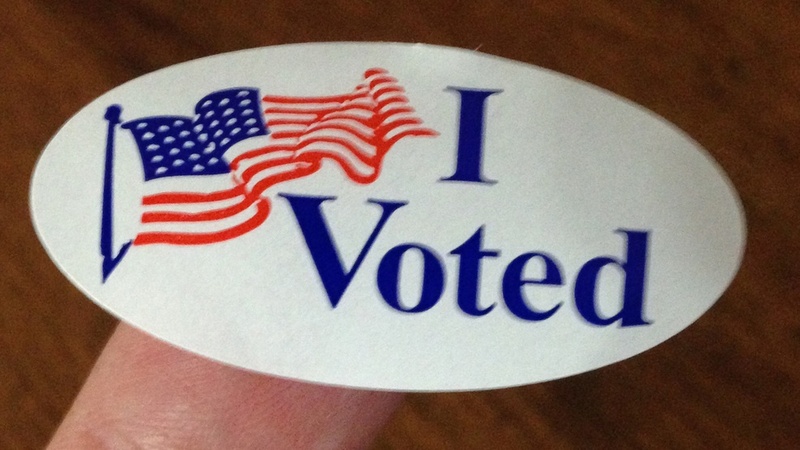 If you are wearing an "I voted" sticker, then Exotic Flowers will give you a free rose. The first 50 people will get the limited edition Patriot Rose. Some of you will be hosting Thanksgiving Day dinners this November and are already busy planning the menu, decorations and seating arrangements hoping this will be one holiday not to forget! The theme is “Giving Thanks”, where gatherings are representative how much you all mean to one another so it might be nice to send your guests home with a small token to remind them of this! One example of a gift that is sure to be appreciated is a bud vase filled with seasonal flowers that you can either buy from a florist or make yourself. There’s no need to spend an exorbitant amount of money or give up hours of time preparing these lively baubles because realistically, we’re all too busy with other holiday chores to add more. You’ll be happy to know that these specimens displayed below can all be created as fast as 1-2-3 and won’t take up more than an hour of your time to design. Choose the one you like most and surprise your friends and family with a take-home Thanksgiving treat. Roses are a fantastic choice when deciding what varieties will work will within small arrangements because they stand alone perfectly by themselves, are available in a multitude of sizes and contain a sweet fragrance that will intoxicate the room. Roses are also imported and grown within a thousand shades of color so you’ll have no trouble finding hues reflective of the New England autumn we’re known for. Think oranges, yellows and greens to mix together or order this presentation of a two-toned head such as the one featured in this picture. Adding a bit of brown fabric to create a rustic feel is another great accessory and can be found by shredding scraps of burlap or similar material. Make sure the container is simple like this glass jar so that there is no distraction from the blossoms and watch your guests melt with appreciation. 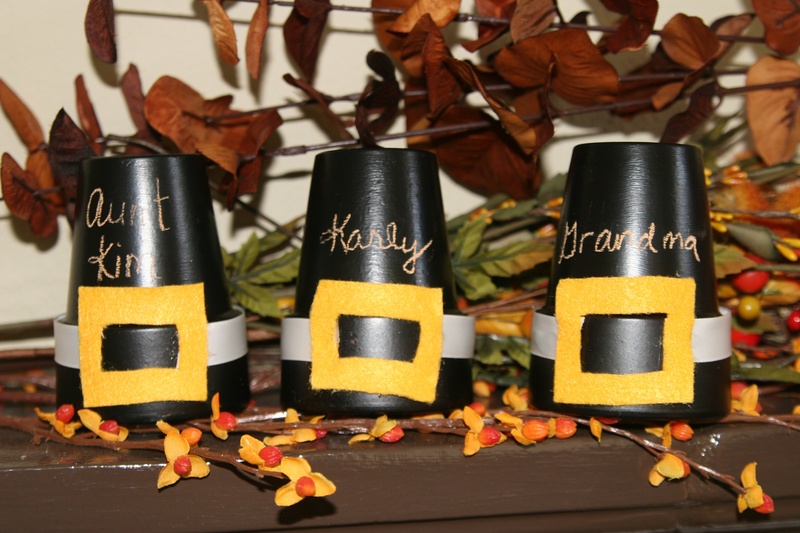 This is another great idea to brighten the moods of the people who will be sitting around your table this Thanksgiving! Simple and seasonally authentic, ranunculus, rose hips and rosemary are stunning when arranged together and will definitely appeal to those who love herbs and garden growing. Two out of three of these flowers can be dried as well leaving this memento the chance to remind others of happy times spent together long after the holiday is over. Remember to stick with a plain but elegant vase to showcase the design and leave at each table setting as a personal centerpiece for everyone who attends. This design is also interchangeable with other flowers of the same tones so don’t be afraid to replace the rosemary with lavender, sage or other greenery if you have something special in mind. If you’re getting married this fall, you are one lucky gal or guy because the colors and textures from which you can work from are simply spectacular. They’ll be no blushes or pastels during the month of November (unless that’s what you really want), only crisp electric color to snap up a bride’s palette. For those who prefer this spectrum compared to other watered-down options, you’ll be thrilled to know that these shades can be utilized anywhere from the floral arrangements all the way to the table settings. Yes, the warm tones are crossing boundaries into unchartered territories such as the brides and groomsmen’s attire, not to mention the cuisine being served, so have fun and explore the possibilities! If you ask me, it’s about time these fall bridal ceremonies bumped up their color game to give guests a real taste of what it’s like to live in New England during November. Here are the first two areas where you can venture inside the richness of flavor and shake up the traditional white wedding “I do’s”. 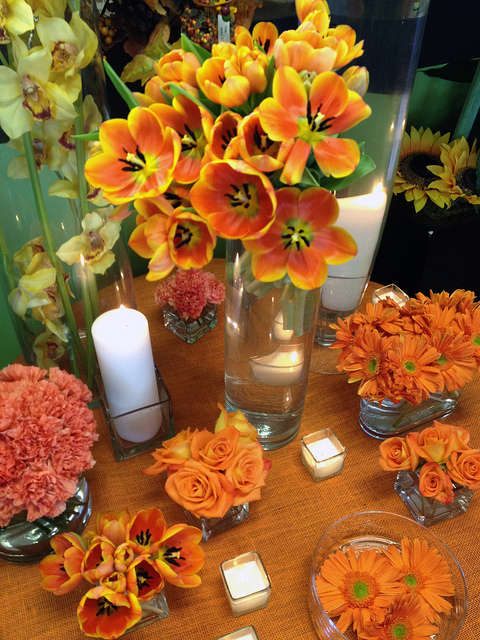 Don’t be afraid to experiment outside your comfort zone and give your special day the pop of color it deserves! 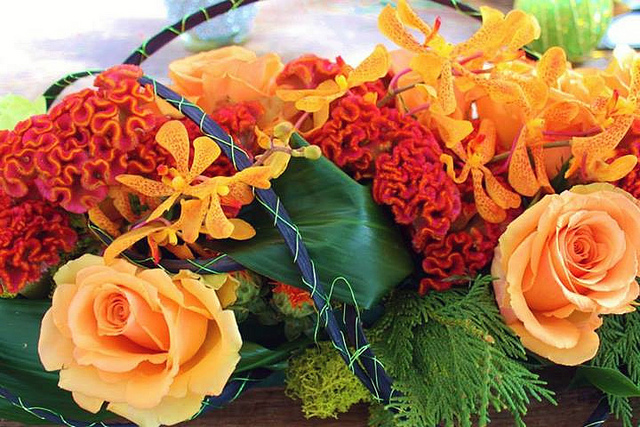 Floral centerpieces are the first place where most people start when trying to design an autumn wedding because the color choices might just set the stage for everything else. We know the obvious shades of gold, red, green, yellow and orange are the obvious choices but you can also insert hints of other gem-tones too. Try purple for instance, which can be varied in several different hues from plum all the way into a deep pink. Hydrangea is an excellent fall variety and can be adjusted to rely heavier on either the green, blue or purple shades as much as the bride prefers. Another welcomed touch of color is black which can darken the contrast and create excitement when mixed with orange. If the Halloween look is not your thing, throw in pieces of cream and green to lighten the appearance. Think lisianthus, chocolate cosmos and cymbidiums when planning this style for yourself. Yum, Yum- wedding cakes are LOADS of fun to design during the fall months! Depending on your taste, orange, green, peach and brown are simply stunning when dressed on the tops of delicious icing. You have the option of having a professional baker use frosting to create your autumn dessert or select seasonal blossoms that will make the display perfect. In my opinion, flowers are always the way to go, particularly when you have such a beautiful variety of blooms to choose from during November. Gerbera daisies, orchids, calla lilies, millet, roses and dahlias make great additives and all are available in a multitude of different festive tones. You can also put an authentic touch on your cake by using maple leaves which have been touched by Mother Nature. A second theory for why people are covering their birds with flowers is due to the aroma-therapeutic benefits that can be infused into the skin. While many of these dressings include herbs such as rosemary, parsley and sage, there are blossoms such as dandelions and nasturtium now being thrown into the mix. 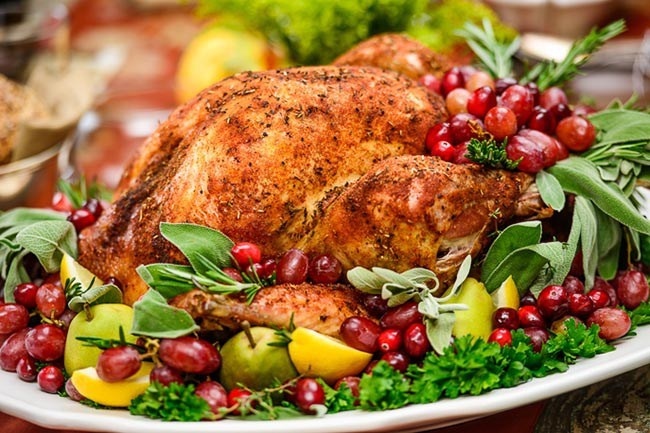 Creative chefs are infusing their meat with an incredible seasoning of sweet to spicy tastes just by covering the top of the turkey’s back and legs with freshly cut florets. 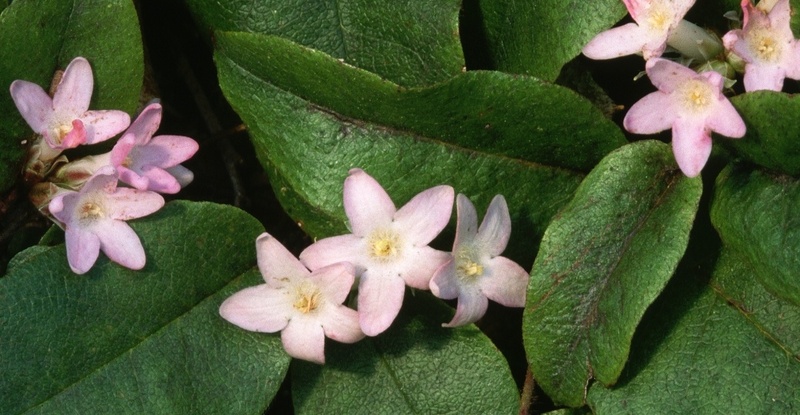 Be careful not to use species like roses that will embellish a musty aftertaste and try choosing varieties that have an earthy consistency such as heather, alliums, chicory, geraniums and borage. New England is the absolute best place in the world to be when celebrating Thanksgiving! Not only do we have the historical background such as Plymouth Plantation and Plymouth Rock, but we also have fabulous crisp and cool weather that is the perfect compliment for Turkey Day. Bostonians have loads of decorative options available to dress up their homes and dining tables including a vast assortment of flowers that might well have been the same that the pilgrims placed on their tables! So what do you think? 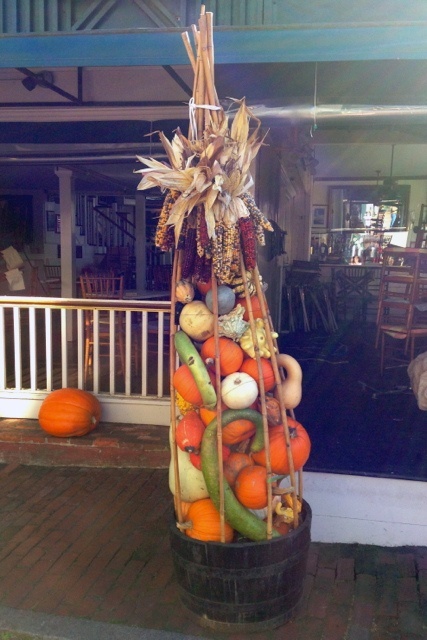 Did the pilgrims really have the creative touch to arrange a few bouquets for their first November feast in America? I would have to agree they did! With so many natural flora and fauna growing wildly around them, why is it so far fetched that they too, might have chosen a centerpiece to accessorize their festive gathering? Wheat ? Beach Roses ? After some careful research, these are a few of the possibilities that the Massachusetts settlers could have used on Thanksgiving. If any of you are history buffs and want to make your holiday as authentic as possible, try digging up one of these for your floral displays! 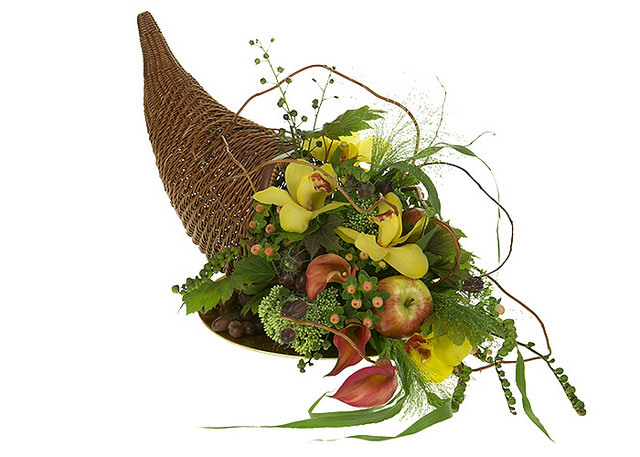 The cornucopia has long been a significant symbol of the Thanksgiving Day holiday tradition. Many of us recognize the decorative marker as a large basket that holds several different seasonal foods and flowers. 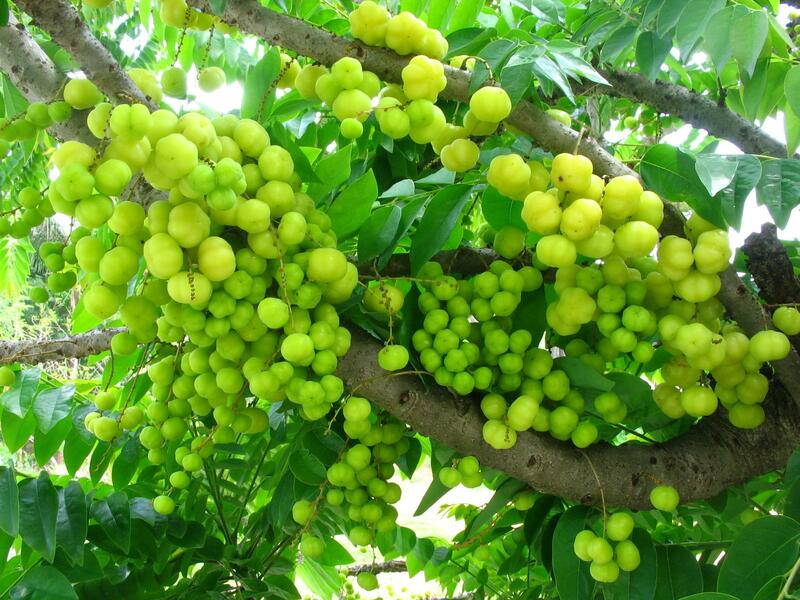 The most popular produce that New Englanders use to stuff the cornucopia are oranges, grapes, apples, bananas, gourds, small pumpkins, pears and artichokes while flowers usually consist of sunflowers, mums, hay, gerberas, calla lilies and mimosa. Over hundreds of thousands of years, families select this centerpiece to be displayed during their celebratory feasts, enticing guests to pull out their preferred treats to enjoy during their visit. Not only is this presentation both visually and tastily appealing, the cornucopia holds great historical importance when tracing back its origins. Take a look where this customary relic came from and enjoy this tale, which will hopefully stimulate an interesting conversation between your guests. Before Zeus was a mighty and powerful God, he was held in the woods to be protected from his father, Cronus. His caregiver was a goat named Amalthea, who swore to keep the boy safe from any harm and raise him herself. The goat nurtured him with milk, food and shelter until the day he was full grown and had received the strength to return to Crete. One day, as the child was playing and laughing with his protector, Zeus accidentally handled Amalthea’s horn to roughly and broke it off leaving her with only one left. 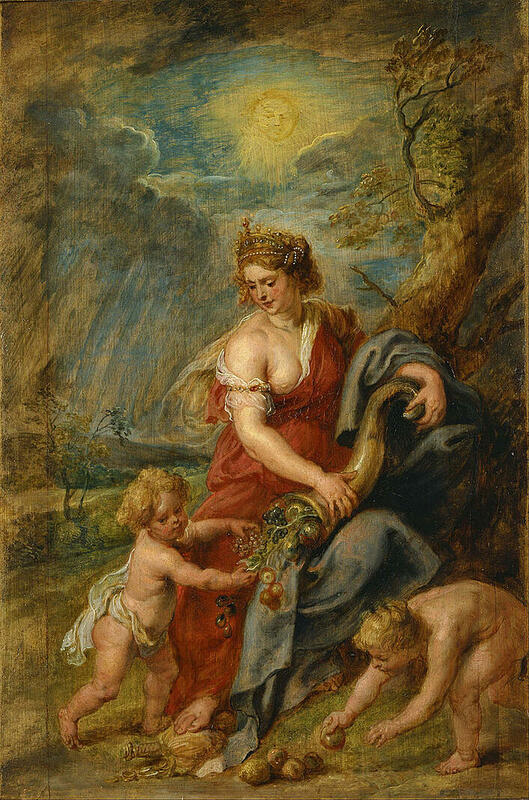 Zeus felt so terrible about what he had done, he blessed the goat’s broken limb to always be filled with an abundance of whatever she might need for the rest of her life. Today, we celebrate the cornucopia as the plentiful horn shaped basket that is consistently filled with nurturing and bountiful gifts. For some Bostonians, the basket has been passed down as a family heirloom and for others, the centerpiece is ordered annually from local florists. If you are looking for some ideas on how to fill your cornucopia this Thanksgiving, here are some of the top requested styles for November 2015. 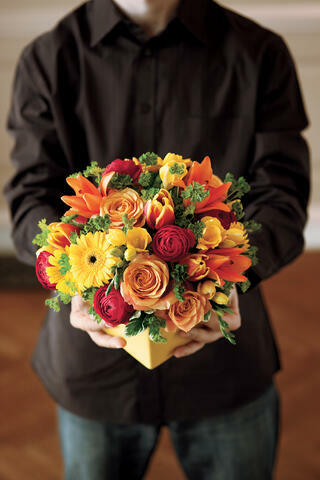 Ordering Thanksgiving flowers are one of the most overlooked tasks for those hosting holiday celebrations. With all of the cooking, cleaning and preparing to think about, it’s no real shocker that it happens a lot. Often the chore is left to the last minute giving the illusion that other issues such as selecting your menus, linens and guest lists are more important. If you’ve ever been in this situation, you know how disappointing the outcome is when you’re left with no other choice but to browse through the leftover section at Stop & Shop. There’s just nothing more depressing than a dead bunch of mums and dried up roses, especially when they’re supposed to be decorations for Thanksgiving Day table. So if you want to ensure a beautiful centerpiece for the festivities, here’s 3 tips that will help you get exactly what you wish for! Order in Advance and by that I mean at least two weeks ahead of time. You might think that phoning your florist this early is silly but actually, it gives them the opportunity to spend more time getting a better understanding of your likes and dislikes. If there is something unusual or rare in your bouquet that you are requesting, buyers will need that extra time to inform their wholesaler if it needs to be special ordered from somewhere else. Remember, the earlier you call, the higher the likelihood of obtaining what you really want for your floral presentation. Let the florists do their work and you do yours. Let’s face it-preparing a Thanksgiving Day feast is hard work! You’re pretty much hands on throughout the entire holiday so let the designers handle the heavy lifting when it comes to your floral creations. By nailing this issue as job#1, you’ll be able to breath a sigh of relief knowing someone else is doing the work and not you! 3. Coordination is the key. Sometimes hosts are initially blocked when it comes to selecting their color palette of napkins, tablecloths and other dining accessories. By ordering your flowers first, you can set the theme early, allowing you to match everything else to the varieties and texture the florist plans on using. If you want to get a little “Martha Stewart”, you can even coordinate some of your menu to the blooms! 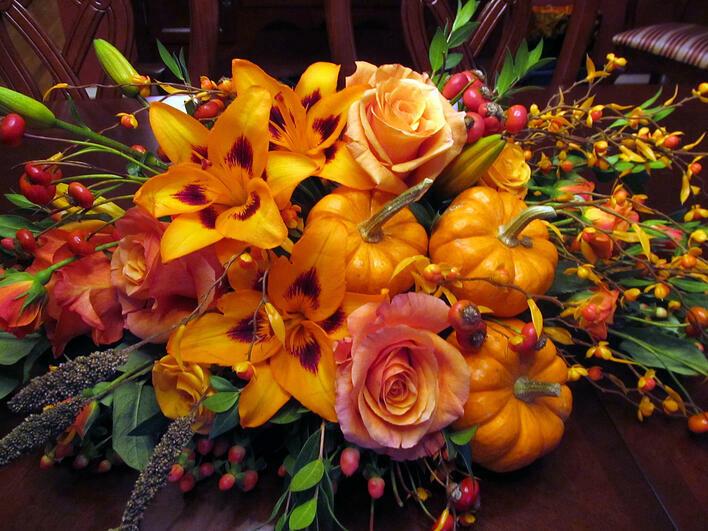 After all, pumpkin pie goes great with orange lilies, mango callas and peach amaryllis! Thanksgiving is right around the corner and many of us are already planning our festivities including our dinner menu, guest list and of course, the floral centerpieces. Flowers are an imperative addition to your holiday dining atmosphere (to a florist anyways) but there are other ways to decorate your home using materials naturally located in your house or items requiring very little cost. Zipping up your abode with color, texture and interesting accessories matching the Thanksgiving Day theme will enhance your celebration with more than just a full belly. Try these beautiful arts and crafts for your holiday gathering and quickly watch them become a part of your annual traditions. 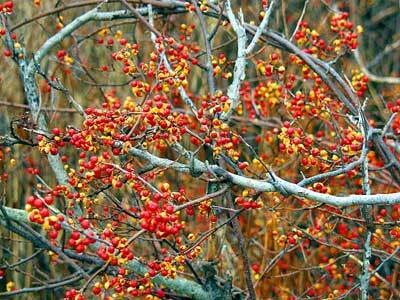 We’re in New England people, so let’s use the gifts that Mother Nature has bestowed on us and tweak both our outdoor and indoor living spaces using these readily available props! Pumpkins should be number 1 on your shopping list because there’s a ton of ways to use these perky little darlings plus they’re cheap. Try lining your walkway with an assortment of different shaded legumes or simply grab a bail of hay and place a few gourds and pumpkins on top to make a seasonal display. 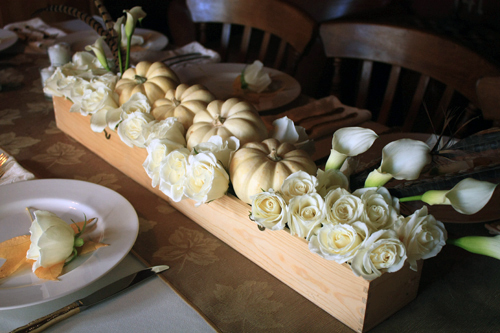 Smaller pumpkins are also great to put here and there on your dining room table as part of the setting. A spectrum of red, yellow and orange fall leaves are wonderful for garnishing platters and pinecones are stunning for making candleholders or wreathes. If you have kids than its time to put them to work! Easy peasy tracing crafts such as drawing their hands and coloring them in to look like a turkey is one way to get art up on your walls ASAP. 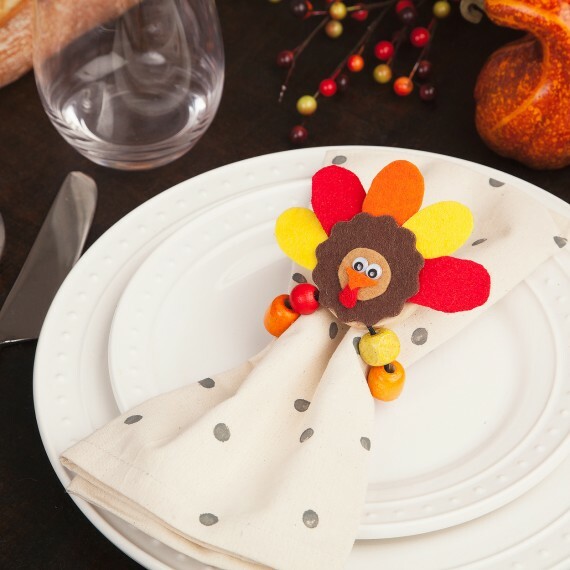 Another fun thing for the tots to do is make a turkey body using anything from clay, Styrofoam, Play Doh or even paper and have them cut out feathers with different colored construction paper. Make all of your guests fill a strip out stating what they are thankful for most this holiday and have them place them back into the turkey using toothpicks. Put in the center of the table and Voila you have your perfect centerpiece! If you love the idea of decorating but you like to keep things simple and uncluttered, you’re going to adore these fancy yet delicate little add-ins you can whip up for your home this Thanksgiving! For dinner labels, I suggest you get some inexpensive pots and paint them with chalk paint ,which you can find at any hardware store. Give them a coat of black and then with regular paint, outline a band around the middle and a gold square to become a buckle. Grab some chalk, and write your guests names to place at their seats. Now they won't only have a delicious meal to dine on but they can take home their own pilgrims hats as a party favor!